Heat oven to 350°F. Spray bottom only of 9-inch square pan with cooking spray. In large bowl, mix cookie mix, oil, water and egg with spoon until stiff dough forms. Stir in Mini Kisses™. Press dough in bottom of pan. Sprinkle 2 teaspoons of the sparkling sugar on top. Bake 18 to 20 minutes or until golden. Immediately top with unwrapped Kisses™ in 4 rows by 4 rows. Sprinkle with remaining 1 teaspoon sparkling sugar. Cool completely on cooling rack, about 1 hour. 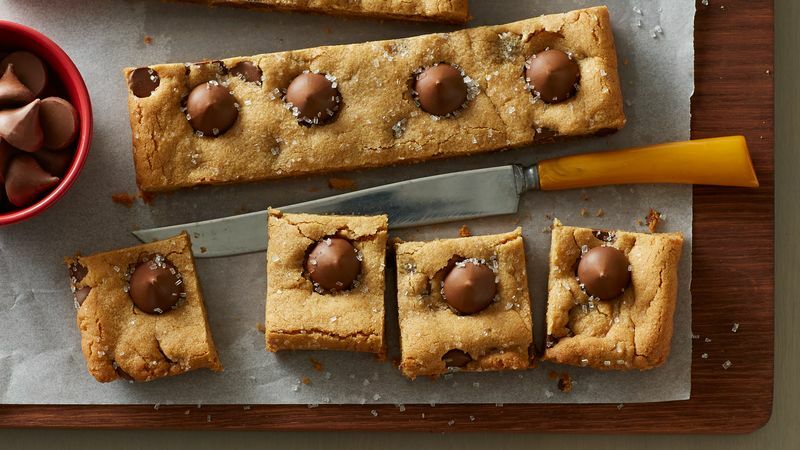 Cut into 4 rows by 4 rows with one of the Kisses™ in center of each bar. Store in airtight container. If using 21-oz pouch Betty Crocker™ peanut butter cookie mix, no change to ingredient amounts or pan size. Bake 20 to 22 minutes or until golden. Makes 16 bars. Can’t find Mini Kisses™? Use semisweet chocolate chips instead. Swap the white sparkling sugar for red and green colored sugars for a festive spin.